The Belgrave is the only cinema on the Northern Tablelands offering an excellent mix of mainstream movies and blockbusters to quality art-house movies for discerning adult audiences. This is supported by the acclaimed Armidale International Film Festival and Armidale French Film Festival. After the closure of the Capitol Theatre in 1983 cinema was kept alive in Armidale by a group of dedicated people who formed “Friends of the Cinema”. Their aims were to show films commercially, while encouraging the re-establishment of a permanent theatre in Armidale. Films were shown at the University of New England by part-time staff and volunteer ushers, averaging 20 screenings per month. 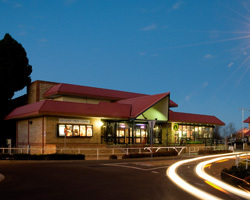 The old UNE Union together with the Ex Service Club began the process of building the cinema, and on February 18th 1995 The Belgrave Twin Cinema was opened. Our cinema comprises two auditoriums with a central foyer. We have three point-of-sale outlets where you can purchase your tickets, with a large and well stocked candy bar with all the usual cinema favourites such as choc tops (multiple flavours), popcorn, and soft drinks. Both auditoriums feature full Dolby Digital Surround Sound, and films are presented via state of the art projection systems. All seats are generously sized with cup holders and fold up armrests for those that... well.... want to have a snuggle with that special someone.